Joseph S. Brick | Attorneys | Brick Gentry, P.C. Joe Brick’s practice focuses on business transactions with a particular emphasis on health law. Joe is proud of his long-lasting relationships with clients like the Des Moines Area Regional Transit (DART) which he has represented since 1976, along with other business and personal relationships that existed prior to that date. Joe was involved in establishing one of the first HMOs, Family Health Plan, and Iowa’s only alternative health care delivery system, SecureCare. He has also been intricately involved in the creation and operation of various types of business organizations including agricultural cooperatives and professional service corporations. 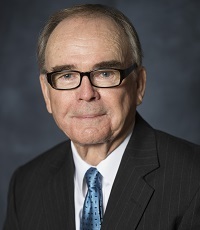 He has always been active in the Greater Des Moines community, serving as mayor of Urbandale and on various boards of directors of charitable, civic and business organizations. While serving as a Special Assistant to the Iowa Attorney General, Joe drafted and was the first legal counsel for the Iowa Tort Claims Division. Joe Brick Honored as "Sage Over 70"